settings that adjust the operation of turboDial for all authorized Users in the account. Clicking the red pencil button in the header bar will open the configuration settings, as shown here. These settings affect all authorized Users, and in most cases they take effect for each User the next time they launch turboDial. So if a User is currently using turboDial when a setting is changed, for some settings that User will not receive the change until they have closed turboDial and re-launched it. Enable Add & Remove tags? Set this to Off if you do not want Users to have access to changing Tags in turboDial. Turning off Tags is a good practice in companies with several agents because it reduces the training required for each agent. Instead of giving agents access to Tags you can instead train your agents to set Call Outcomes and then setup Call Outcome Automation to manage the Tags. If you want to enable the display of the Callback Date in the Call Outcomes area of the turboDial panel, then you must turn this Tag display option to “Off”. Set this to Off if you don’t need List Dialing features. When List Dialing is disabled you will see a Dial Pad (sometimes called the keypad or dialpad) in the bottom-right corner of turboDial. Set this to On if you want to force all outbound calls to be recorded. Inbound calls can also be recorded if you have the Enhanced Inbound add-on. Display Control for Hangup on * ? This should generally be left set to Off. In turboDial the * key can be used to disconnect the other end of a call while keeping you connected, so you can immediately begin your next call. However, some bluetooth headsets have been found to introduce tones into the voice path and those tones can mimic the * key and cause a call to be dropped. Also, some phone systems you call in to may want you to use the * key to dial an extension. So the option to ignore the * key is made accessible by setting this switch to On. When this switch is On, a green * is displayed by Calling Device when the Calling Device is not “This PC”. Then when that green * is clicked to cause a red line through it the * key can no longer be used to disconnect a call. If you want to enable or disable the * key for disconnecting calls, you must do it before you make your call. Append Notes to Person Notes? When set to On any notes that are manually typed into the Call Outcome section of turboDial will also be appended to the Person Notes field in the Infusionsoft Contact Record. Only the typed comments will be appended, and the rest of the information included in a turboDial Call Note will not be included in what gets appended to the Person Notes. This item is explained in this section. Include Future & Complete Tasks? Include Notes with Task Display? Display My Tasks & Quick-Add? This tab pane displays the currently due and not yet due tasks for the logged-in user. In addition, a “Quick-Add Task” button is added to the Contact Information section of turboDial, as shown here: The Quick-Add Task button can be used to quickly add a new task for the current contact. Restrict views to owned records? When this setting is set to On turboDial will restrict the Search Tool and Saved Searches to only include Contacts owned by the turboDial User. When this setting is set to On then results returned by the turboDial search tool will be limited to Contact Records that are owned by the User who is logged in to turboDial. This means different Users in your team will see different results when they perform a Search Tool query in turboDial. When set to Off all matching Contact Records will be returned regardless of the Owner. When this setting is set to On then a Saved Search List loaded in turboDial will only include Contacts owned by the turboDial user who is loading the list. This means that different Users in your team will see a different set of Contacts loaded when they load a list in turboDial. Note, with this setting “On” a list loaded for Power Dial or Dynamic Dial can no longer be shared by multiple Users in your turboDial account. If you need to have multiple Users dialing to a common list using Power Dial or Dynamic Dial then you must disable this setting. This setting is intended to support your permissions in Infusionsoft and if this setting is set to On you will likely also want to set Infusionsoft User permissions to disallow Users from viewing Contacts they do not own within Infusionsoft. With Infusionsoft permissions set accordingly then your turboDial users will have no access to any information for Contacts they do not own. Add Contact on Inbound Call/SMS? – For an Inbound SMS message if the from phone number cannot be associated to an existing Contact Record. – For an Inbound Call if the turboDial account includes the Enhanced Inbound add-on and the from phone number cannot be associated to an existing Contact Record. When a Contact is automatically created from a call or SMS the only reliable information to include in the Contact fields is the phone number. The first name of the Contact will be set to ‘(auto-created)’. When set to On turboDial will play a beep every 10 seconds to a Calling Device phone that is connected but not on a call. If you prefer not to have beeps you can set this switch to Off. Lookup Numbers & Mark Invalid? When you click the question mark button turboDial will use the Twilio number lookup feature to display any known details about the number. Each lookup will be charged 6 cents by Twilio. When you click the trashcan button the selected phone number will be set to type=Invalid for that Contact in your Infusionsoft Account. Phone Numbers with type=Invalid will not be displayed in your phone number selector in turboDial. If you need to set a phone number back to valid open the Contact Record in Infusionsoft and modify the Phone Number Type available there. 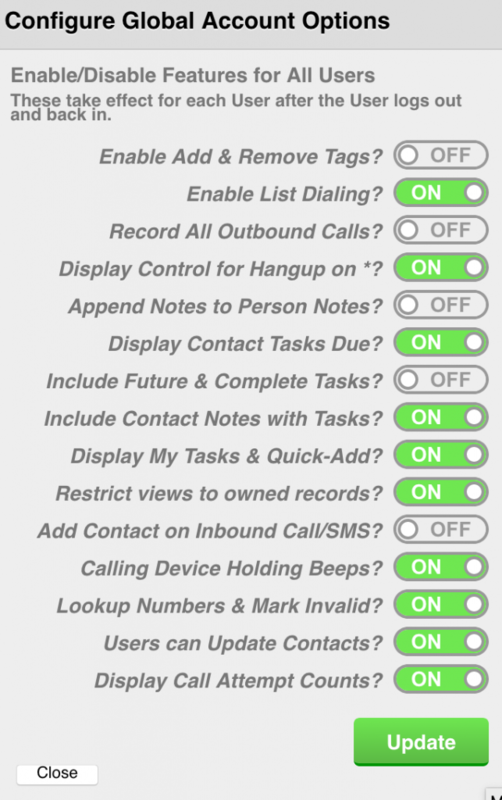 When using this feature you should open “CRM->Settings” in your Infusionsoft account and add a Phone Type of “Invalid” to the list of phone types. 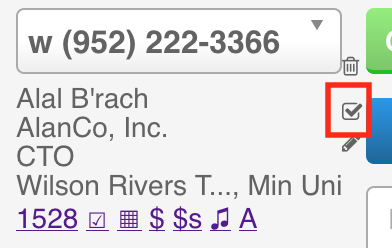 When set to On all turboDial Users will observe a small “pencil” button to the far right side of the title or address information in the Contact Info section of the turboDial panel, as shown in this image. When you click that button a form will open with the current information for the displayed Contact. You can modify fields in the form as needed then click the “Update” button to save your changes into the Infusionsoft copy of the Contact Record. 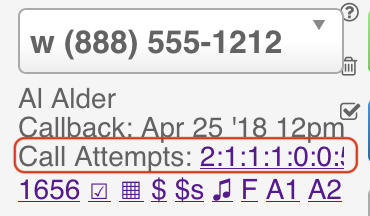 When set to On all turboDial Users will see a “Call Attempts:” field one or two rows below the Name of the currently viewed Contact. 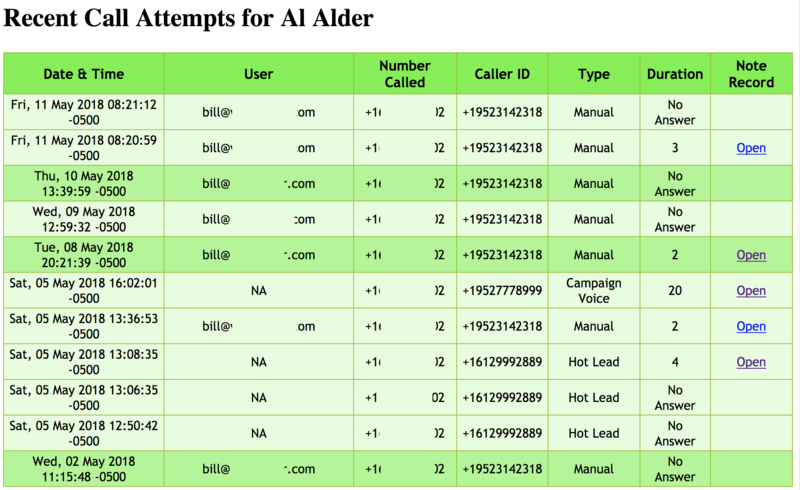 That field will display the count of Call Attempts for the past 7 days as a clickable link, formatted as shown in the first image. The entire field may not be visible unless you scroll it left. When fully visible it appears like the next image.